Although it’s the first day of school across British Columbia, here in West Vancouver our Kindergarten children do not start school until tomorrow. Their Gradual Entry Program begins on Wednesday when we will welcome small groups into the classroom over the next few days, and provide the children with time to familiarize themselves with us, the classroom routines and their new classmates in a gentle and unhurried manner. For the past week we’ve been busy setting up our classrooms, and we’ve been doing so with an eye to the children’s self-regulation. Of course we will be specifically teaching the children about the Zones of Regulation, identifying feelings and emotions and exploring mindfulness. But there are also some things we can do to prepare the physical environment of our classrooms to support self-regulation. Stuart Shanker, in Calm, Alert and Learning: Classroom Strategies for Self-Regulation, reminds us that a classroom environment with reduced visual and auditory distractors can help students to concentrate better. Here are some of his main points, and what we’ve been doing in our classrooms. Lots of natural light. We both have lots of windows to appreciate the natural light which flows into our classrooms. Sometimes we will lower the blinds but in the “open” position so we can still have light. Our windows also have a special reflective coating on them so the children can see outside; however, others are unable to see in. Minimum of artificial light. We keep the overhead lights “off” in the classroom generally, although the grey, cloudy days make the room quite dark. Sometimes one bank of lights turned is on because it’s necessary for reading and printing! 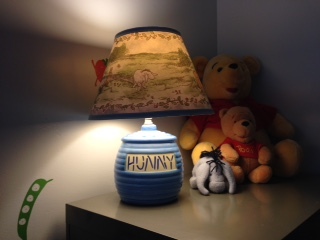 We’ve purchased several lamps (or cast-offs from home) to provide some atmosphere and they make the classroom feel warm and cosy. Soft paint colours in a non-gloss finish. As teachers we don’t often have a lot of choice in the paint finish of our classrooms; we both have the standard “white.” Christy’s cupboards are a soft blue and mine are naturally finished so we are fortunate in that regard. We’re just happy to freshly painted classrooms and that our classrooms schools are beautifully maintained by our District Facilities group. No vibrant colours. Not living with colour in the classroom is something we have both struggled with. We love colour: colour energizes us, inspires us, provokes creativity, brings us happiness, and is necessary for our mental well-being. We know there are many self-regulated classrooms which have gone with a neutral colour scheme, but that wasn’t for us. We spend many hours in our classrooms so our compromise has been to decorate our classrooms in a blue (to suggest the sky or ocean) and green (to suggest fields and forest) colour scheme, both of which bring a sense of calm and tranquility to our teaching, and therefore, the children’s self-regulation. This year we also tried something different. 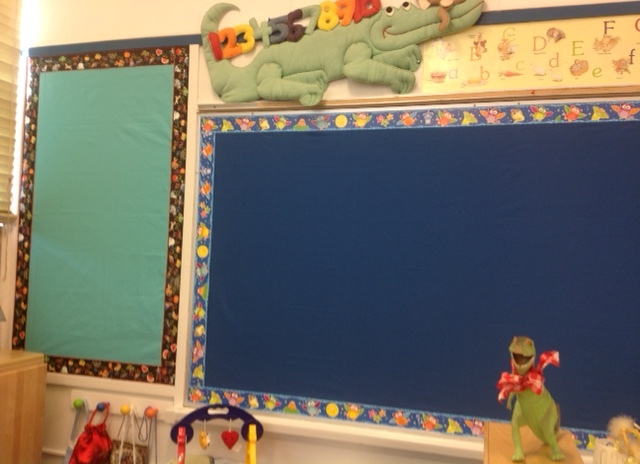 Instead of using paper to cover our bulletin boards, we used broadcloth to help absorb the sound better, plus being more environmentally responsible as fading should be less and the fabric won’t need to be replaced every year or two. Organise everyday materials and put away other supplies. In continuing with our blue and green colour scheme, we have primarily blue and green baskets to organise the children’s table school supplies, plus some pink for fun. 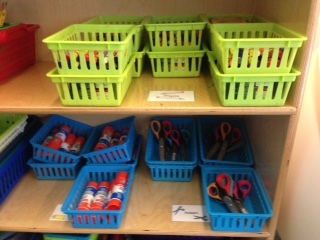 We place all daily school supplies (crayons, gluesticks, scissors, felt pens) in their baskets in a designated, labelled bookcase, and teach the children in the first weeks of school how to give out and put away the baskets. The rest of the children’s school supplies for the year are stowed away in the cupboards. We use clear tubs of for organizing Math manipulatives and Activity Time toys and shelving/tub systems for areas such as the Imagination Station. Reduce wall clutter. We don’t like any kind of clutter; we find it overstimulating and not helpful in our own self-regulation. We use our bulletin boards for displaying student art work. The children, and us, need to be surrounded by the beauty of their own creations, and to develop an appreciation of their own, and others, efforts. We display only what we deem essential: Alphabets, number line, our Math Their Way calendar, math rotation groups and the Visual Schedule. Although we are often printing Alphabet letters, recording our brainstorming and demonstrating art projects, these charts usually come down or are put away soon after we’ve finished using them. Tennis balls (“Hush-Ups”) on the chairs. 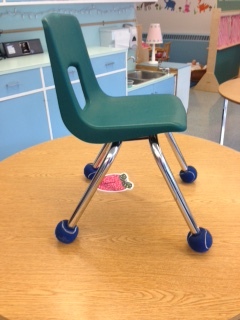 The sound of the chairs banging against the table legs and floor was one we endured for many years until we were able to order these “Hush-Ups” through a Parent Advisory Council (PAC) grant for self-regulation materials last year. Carpets on the floor. My classroom is carpeted so the noise level is generally quite low. Christy’s classroom is not carpeted but she was able to purchase, through the PAC grant, additional small carpets for some of her play areas to reduce the noise. All the teachers in our school were fortunate to be able to select a beautiful, decorative carpet for our classrooms, paid for by our PAC. Room organisation. Although it seems logical that every classroom needs a quiet area for Meeting Time, sitting and discussion, the physical classroom itself does not always lend itself easily to determining where that might be. Our Alphabet carpet area is the quiet space, and we’ve tried to surround it with low storage units or bookcases and the Special Helper’s chair to make it feel safe and enclosed. We both have our quiet space deep into the classroom and well away from the door to help eliminate unnecessary distractions. Well, our classrooms are ready, supplies are in their baskets and the activities are on the tables for the children. We’re all ready for the Kindergarten and looking forward to facilitating their new journey as self-regulated learners. Had a couple conversations around this topic over the past week. In brief, I got teased when my classroom started the year a tad ‘blah’ compared to the vibrant colours in many of my colleagues rooms. But of course, that worked for them as learners – bright stimulating classrooms……or at least it worked for the target audience of learners that would be engaged no matter what (or who) was in the room! Didn’t know at the time (but it felt right) that mindfully creating the classroom as a herd enabled everyone a sense of ownership and understanding of what was where and why. Thank you for sharing! Fabulous ideas and reminders for all of us as we get ready for a fabulous school year! !